This plan was published in Strype's 1720 annotated edition of Stow's 'Survey of the Cities of London and Westminster'. 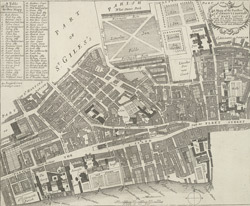 It shows the Savoy, Somerset House and gardens, Exeter Exchange and temple, and Lincoln's Inn. St Mary-le-Strand church opposite Somerset House is inserted but unnamed without the reference in the table.